If you haven't run out of steam as you finally reach Appendix K of the recently-released preliminary alternatives analysis, you will come across an intriguing fact: by the year 2025, Caltrain plans for a best trip time of 65 minutes from San Jose to San Francisco 4th & King, and 70 minutes to the Transbay Transit Center. The Baby Bullet we know and love does San Jose to San Francisco in as little as 57 minutes (by the timetable, which is generously padded at the end of the run to make on-time performance statistics look better). In practice, diesel bullets can and do make the run in 55 minutes. How can this possibly be? $6 billion later the best commuter service will be 10 minutes slower?!? How can a timetable, the very root of years of painstaking planning and carefully apportioned capital investment, the embodiment of a grand vision of improved commuter service, the next coming of the Baby Bullet, fall so terribly short of what could have been? How many microseconds will it take for the entire NIMBY universe to latch on to this inconvenient truth? Caltrain plans to give up (that's right, give up!) commuter trains overtaking each other, despite the presence of a third and fourth track in what is nominally a "shared corridor", and henceforth operate on just two tracks. The reason offered is that overtakes are operationally unreliable--but that is only so because Caltrain's existing passing tracks are very short, and Caltrain's existing gallery cars turn station dwell times into a game of Russian roulette. By 2025 both of those reasons will have vanished. Confining Caltrain to a separate, 2-track system does not take advantage of any synergy with HSR, and perpetuates a false choice between speed and frequency. Today this trade-off is biased in favor of speed, but the Baby Bullet limits throughput to 5 trains per hour. In Caltrain's proposed 2025 timetable, based on the BART model, the trade-off is biased in favor of throughput (one train every six minutes!) but average speed suffers just like BART's. In a fully HSR-compatible system with a mid-line overtake, this constrained trade-off would be removed entirely, freeing Caltrain to provide both speedy AND frequent service with cross-platform transfers. The underlying assumption appears to be that with HSR in the mix, Caltrain will no longer need to provide express commuter service. Even as Caltrain is starved of operating funds and teeters on the brink of bankruptcy, it appears perfectly willing to cede its highest-yielding ridership to the HSR operator, with no guarantee that service will mesh together with convenient timed transfers and a common fare structure. Some might say, if there will be a high-speed train every five minutes in each direction, how could there possibly be any spare track capacity to allow Caltrain to overtake on the high-speed tracks? This question is ill-posed: a portion of that ridiculously frequent HSR service would no doubt be used to serve intra-peninsula demand that Caltrain could not tap into if it were stuck on two tracks with slower trip times. The track capacity should be re-allocated to better meet demand. The fundamental issue here is one of flexible and dynamic allocation of a scarce and valuable resource: track capacity. If you build two separate systems that are not designed to inter-operate (freely sharing tracks and stations), then you cannot adjust service patterns to meet the demand that actually develops. You're stuck with guessing what demand will be 25 years from now, and quite literally casting it in concrete. The outcome, more likely than not, is sub-optimal, with demand under-served and resources under-used. An improved timetable that provides both speed AND frequency through the implementation of a mid-line cross-platform overtake. With those features, a good case could finally be made that the high-speed rail project would produce tangible benefits that trickle down in measurable ways to each and every community along the peninsula rail corridor. Sadly, right now it looks like those $6 billion will buy us 10-minute slower commuter service. This is simply unacceptable. This post is the first in an open-ended series, picking through the recently-released preliminary alternatives analysis. The AA is a voluminous document with plenty of material to be dissected over the next several months, in no particular order. The rail corridor must be 100% grade-separated, with no crossings, so passengers may only cross the tracks via pedestrian underpasses or overpasses, never at grade. To access an island platform, or the platform on the "far" side of the tracks for at least one direction of a passenger's daily commute, every passenger will use underpasses or overpasses at least twice daily regardless of station configuration, and regardless of which side of the tracks they might live or work. Putting Caltrain on the west side of the corridor, rather than in the middle, might save each passenger a grand total of 30 feet of walking distance, far shorter than the stairs or ramps to the platform or the walk to the doors of an 85-foot rail car. It takes seven seconds to walk an extra 30 feet. Some hike! In a 100% grade-separated corridor, it is given that station access will be limited to a handful of access points somewhere along the 800-foot length of a Caltrain platform. As long as those are well-planned (e.g. Belmont), that's perfectly acceptable. The station access "advantage" of putting Caltrain on the west side of the corridor is insignificant. In the AA profile plans of Appendix B, page 3, a design criterion is established: the maximum grade for Caltrain (shared use) tracks with diesel-powered freight trains is 1.0 %. The community impacts of this gentle grade, required exclusively for freight trains, were previously discussed. And yet, Caltrain's own engineering standards state that "maximum design gradient (...) for grades up to two (2)% may be implemented with the approval of the Caltrain Deputy Director of Engineering. (...) Grades exceeding one (1)% shall be limited to tangent length less than 1200 feet." Why is a more stringent standard now being applied? Certainly not for high-speed rail or Caltrain, both of which will easily handle 3% grades. The results of this conservatism are already apparent. For example, the proposed elevated alignment through downtown San Mateo would require lowering 1st, 2nd, 3rd, 4th, 5th and 9th avenues, with extreme community impact, because (a) the grade is 0.8%, even less than the specification, and (b) there is a requirement to return to grade level before the curve into Hayward Park to avoid having a vertical curve in a horizontal spiral, a track geometry complication exceptionally allowed for (see TM 2.1.2 paragraph 6.1.7) in the CHSRA's own track design guidelines. Let's face it: the age of picks and shovels is over; in the 21st century, computers, lasers and differential GPS should make the construction and maintenance of overlapping vertical and horizontal curves a breeze, without having to demolish half of downtown San Mateo. With things already tight as they are, the time for making judicious and appropriate design exceptions is now. Using overly-generous specifications will unnecessarily constrict the design space, inflame community opposition, and drive costs through the roof. While the recently released Alternatives Analysis steals the spotlight, in the background there is even more trouble brewing for Caltrain. Last week, Caltrain's electrification project was stopped dead in its tracks by an explicit lawsuit threat made on behalf of two litigious organizations, the Planning and Conservation League and the Community Coalition on High-Speed Rail. The former is a plaintiff in the so-called Atherton lawsuit, and the latter is associated with another pending lawsuit. The threat was made in this letter (640 kB PDF file) from attorney Gary Patton. The letter not only complains of the age of the EIR (last circulated for public comment in 2004), but more importantly, it argues that the project has substantially changed and has effectively become part of the peninsula HSR project, by virtue of the MOU signed by Caltrain (a copy of which is attached to the letter) and the funding arrangement whereby HSR funds might pay for a portion of the electrification project. The replacement of Caltrain's aging fleet (a large portion of which was acquired circa 1985) will be delayed by several years, likely causing Caltrain to miss the window and undertake early replacement of obsolete equipment with more diesel-hauled trains rather than electric multiple units. You can stop the clock on the HSR project, but you can't stop the clock on aging of equipment. With a barrage of lawsuits being lined up against the peninsula HSR project, Caltrain is already getting caught in the crossfire. Any project that enables or facilitates the eventual construction of HSR is seemingly fair game. 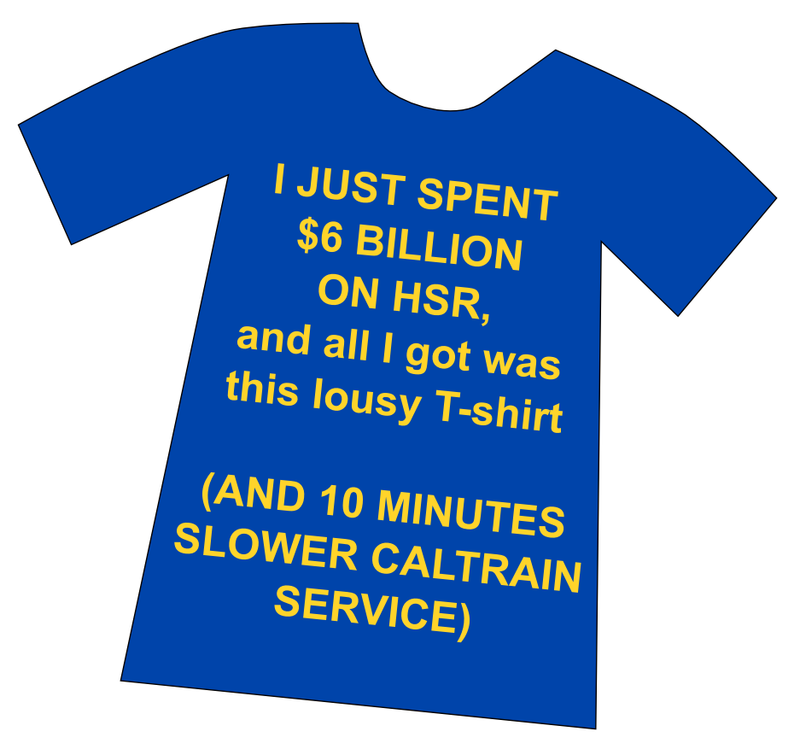 For better or for worse, Caltrain is now in a shotgun marriage with HSR, enforced by these legal threats, with environmental clearance, engineering and construction likely unable to proceed independently. There is very little that Caltrain can do about this besides duking it out in court. On the flip side, maybe this is an opportunity to finally undertake the design of a integrated system, where Caltrain and HSR are built as a single project rather than two independent operators awkwardly sharing the same corridor. This blog has always promoted compatibility, whether it be platforms, train control, timetables, to maximize the synergy between the two systems--something in which Caltrain has shown dishearteningly little interest so far. 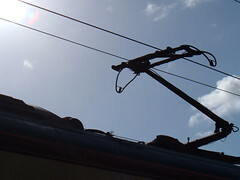 Perhaps this setback of the electrification project will prompt some reflection. UPDATE: the California High-Speed Rail Authority sheds a crocodile tear over the potential demise of Caltrain, no doubt trying hard not to covet the 700 acres of pristine rail corridor real estate that would suddenly become available. Can Obi-Wan Doty save the peninsula commute from the evil HSR empire? The Peninsula Rail Program finally releases its long-promised Context Sensitive Solutions toolkit. The toolkit allows anyone to provide specific input and recommendations on the details of how the peninsula HSR project should be configured. The toolkit contains some detailed maps and explains the pros and cons of various options. There is no review period or deadline. The slam-dunk certification of the electrification EIR unexpectedly bounces off the rim after a threat of lawsuit over the lack of (recent) public circulation. Who sat on it since the public comment period way back in 2004? Probably the FTA. The access to the TTC seemingly utilizes two new tracks tunneled under 7th street, which are said to be completely separate and independent from the existing tunnels 1 - 4 all the way out to Brisbane, where the giant HSR yard is planned. Could this clearly unaffordable and redundant infrastructure possibly be the setup for a future descoping of peninsula commuter service to a comparatively more sensible Millbrae - Santa Clara link? Thankfully, the plan for tail tracks extending under Main Street seems to have been dropped. Access to the Caltrain platforms, previously criticized for having only a single access track, now sports a new "emergency" crossover for Caltrain. Why this crossover is not simply considered a regular feature of a competently-designed station throat is a mystery, although it may be related to the fact that it uses (horror of horrors!) curved turnouts, which are generally unknown in AREMA circles. Such a strange and unfamiliar piece of trackwork must no doubt be used only in an emergency, such as if Caltrain actually needed to serve downtown San Francisco. The crazy-tight curve radii (650 feet!) are deemed commensurate with the station in Cologne, Germany where, incidentally, these "emergency" curved turnouts are used everywhere. If they can do it, we can do it. Another thing that the Germans seem to have figured out is that you don't put such tight curves 1.5 miles out from the station, and that all the crossovers lie within 800 feet from the platforms, rather than 2500 feet as planned in San Francisco. "High-speed" trains will have to trundle along at 40 mph for a couple of minutes, and tie up key trackwork for way longer than necessary, unless designers finally decide to study a bit more attentively what makes Cologne tick. The much-awaited Alternatives Analysis for the peninsula will be pitched by Bob Doty on Thursday in San Jose. 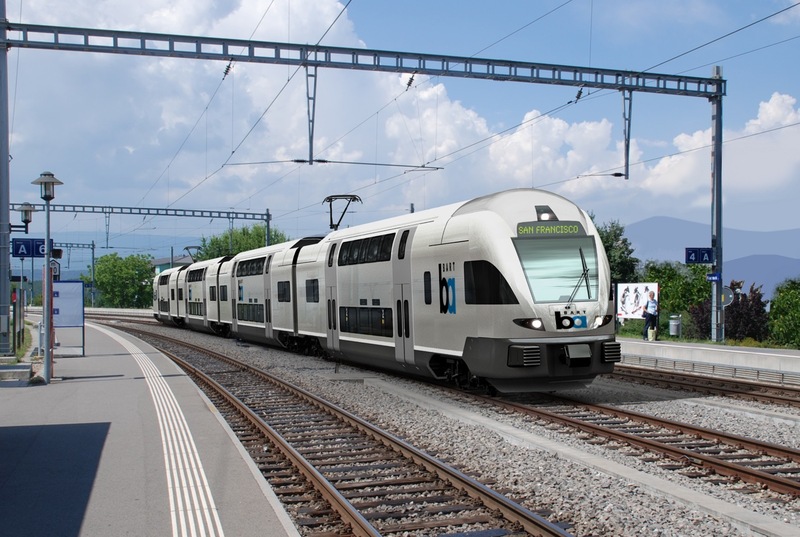 The impacts of high-speed rail on commuter service will be of particular interest. Note: opening picture shows a BART Stadler DOSTO "ringing the Bay" circa 2022. Unless, that is, somebody decides that it's better to have incompatible platforms, incompatible train control, AND incompatible track gauge.